Nabadisha project was started in 1999 with a mission of addressing problems such as lack of education, lack of support system in the form of coaching classes and proper nutrition and recreational facilities. A major objective of WIF is to bring the Kolkata police authorities and personnel at the ‘Thana' level, closer to the street dwelling communities and facilitate regular interactions between them through the literacy centres, which should ideally be held at the thana premises. In collaboration with Kolkata Police, WIF runs Nabadisha Project for street children in 15 Police Stations at Ballygunge, Bhawanipore, New Alipore, Charu Market, Chetla, Entally, Amherstreet, Chitpur thana, Tala Chitpur, Burtolla, Shyampukur, Manicktala, Jorasanko, Ultadanga, Tangra and Jorabagan. WIF provides bridge course education to 47 children. The children know their alphabets, are able to write words and sentences, can count and write numbers. They have also learnt addition, subtraction, multiplication and division. During the year 65 children have been mainstreamed. 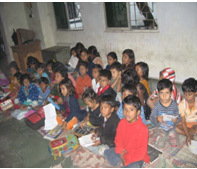 490 children attend the Remedial class. The teachers help the children with their homework and give guidance that of a private tutor. This support is provided to prevent dropouts. WIF provides educational materials such as slate, pencils, chalks, mats, small exercise etc. Toys are also provided for their entertainment. WIF provides supplementary nutrition such as bread, bun, jaggery, eggs or seasonal fruits. The Supervisor and teacher generate awareness on personal health and hygiene. The children undergo free health check-up every month. In case of illness the doctor at the ‘Thana' treats the children. All the children have health cards.